Nine people have died from using fake drug made by a Chinese pharmaceutical company in northeast China's Heilongjiang Province, hospital sources said on Monday. The nine people died of acute kidney failure after using the fake Armillarisni A injection made by the Qiqihar No. 2 Pharmaceutical Co. Ltd., said officials with the Third Hospital affiliated to Sun Yat-sen University in South China's Guangdong Province. Among the victims, five had been confirmed dead from using the fake drug by May 16. Local police in Qiqihar, in Northeast China's Heilongjiang Province, took a total of 14 staff from the company into custody after the deaths, the Xinhua News Agency reported. And following orders by the Ministry of Public Security, five officials including the manager, two deputy managers, the inspecting officer and purchasing agent from the company, have been taken to South China's Guangdong Province as the investigation continues. Meanwhile the compensation procedure has begun, although it has not yet been decided who will compensate the victims, local press reported. Liao Xinbo, vice-director of the Guangdong Provincial Department of Health, was quoted as saying the pharmaceutical company could be ordered to pay compensation to the families of people who died or those who were injured by the fake drug. 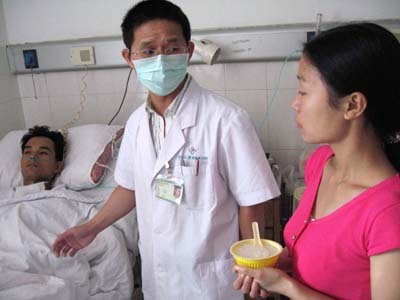 According to Liao, the hospital did not make any mistakes when treating the patients. "The hospital was not responsible for the medical accidents," said Liao. In another development, on Saturday the Qiqihar No 2 Pharmaceutical Company was revoked production permission. Five drugs made by the company have been found to be fake, including the deadly injection fluid, according to sources with the Heilongjiang Provincial Food and Drug Administration. Meanwhile, the State Food and Drug Administration will begin a nationwide drive to regulate the medicine market. Drug administrations have launched comprehensive checks of raw material purchasing procedures, management of materials and examination of finished products at pharmaceutical plants. On Friday Premier Wen Jiabao sent officials to investigate the deaths caused by the fake drug and promised that anyone who broke the law would be punished. The Qiqihar No 2 Pharmaceutical Company has blamed a supplier that it said had provided toxic diglycol instead of propylene glycol, which should have been used in the drug. But the company admitted its safety inspectors had failed to spot the toxic chemical.